Microsoft today announced Windows 8.1 which will be coming later this year. This is just one step update from Windows 8. Existing Windows 8 users will get this update for free. Filled up with new features and update. 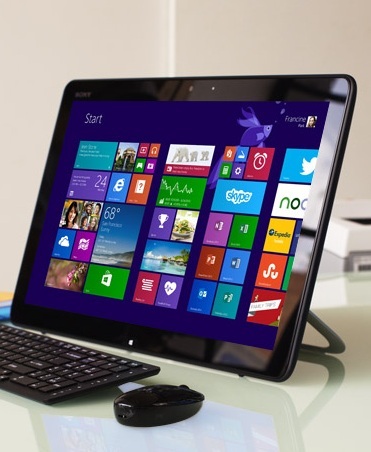 Windows 8.1 users will be available to stream music for free from their about 30 million. You can download app from Windows Store where about 100,000 apps available at the moment. Windows 8.1 will be using the ‘Modern’ UI which Microsoft think is the best user interface for Windows. There are lots of tablet users out there, so they made the OS tablet user friendly as well. That’s a good thinking, but for the users like me, not cool man! I like the Windows 7 start menu. There is a Start button on the desktop screen but with very limited option. The update will bring a lot new features to the end users. You can sweep between the screens or resize it easily to fit the screen or drag and drop to organise items. Microsoft has unified the search, now you get the results in groups. The app store has got a new look in this version of Windows. More improvement with the Sky Drive – built-in cloud storage to sync your document files. Kinect sensor for Windows is coming next year. Developers can apply to get it in November to start building apps. Windows 8.1 can be operated using a Microsoft Kinect sensor and more easy to use. The way you use your Kinect with your Xbox 360. Microsoft released a preview version of Windows 8.1 to try today. The ISO file is not ready yet to download but will be available by tomorrow 27/06/2013. You can download the file from Microsoft’s Windows 8.1 Preview page. If you are in the US right now and using Windows 8 you can download a small update to try out the new Windows 8.1 now.